– Inserting (or importing) a list of web page addresses, the app will use those web pages as a seed to start to collect data and visit linked pages, proceeding in a background navigation to the requested deep level collecting data till the user decide to stop. 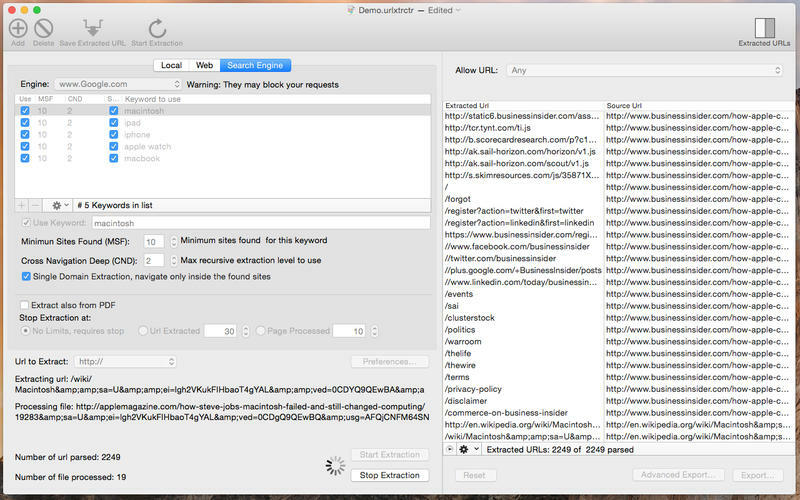 The user can watch live, during extraction, the extracted URLs filling the table. Filters can be used to decide what accept or exclude. The app uses various settings that can be modified to find the right balance for any search. URL Extractor is document based to allow the user to save all the settings relative to an extraction, local based or on web based , inside a document to save on disk for later reuse. Considering the large and dynamic nature of the web, an extraction with some specific parameters could be infinite and with different results at different time. – Extracts directly from the web cross navigating web pages in background. The list of web address the user can provide it’s a seed to start an infinite autonomous navigation and extraction. No user action required! – Search engine Google extraction from many international google sites using .com .it .fr . au .uk .de and .es .ar .au .at .be .br .ca .fi .nl .se .ch. – Fully parallel processing on Cocoa using the latest Objective-C 2 technology. – Uses separate parallel processes to navigate and extract, no freeze during extractions! Use of the app requires a minimum of practice to obtain good results. Money back if you buy and you don’t like this app! Please DO NOT trust negative reviews. Please come to our site and download an unlicensed version to check by yourself if it works or not.